You can help provide for the medical and hygienic needs of Christians driven from their homes by Islamic extremists. Tens of thousands of our Christian brothers and sisters have lost all their earthly possessions through persecution from groups like ISIS. 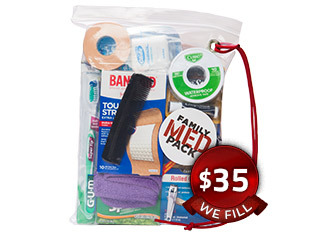 Family Med Packs provide these families with daily essentials like bandages and toiletries. The packs are customized in the field to fulfill specific needs in different nations, including Iraq, Syria, Sudan and Nigeria. For each $35 donation, VOM will fill, ship and distribute a Family Med Pack in the country where it's needed most. Before distribution, field staff will customize the pack with specific items, such as infant formula and diapers, feminine hygiene products or pharmaceuticals. If you would like to fill the pack yourself, visit our Fill a Family Med Pack page. You may sponsor multiple packs in $35 increments below.